Most married women eventually become either widows or divorcees. That undeniable truth impacts the lives of women, whether they think about those eventual outcomes or not. Everyone knows women, on average, live longer than men, and that actuarial fact creates a specific segment of the population called widows. It is still true that men tend to marry women who are younger than they are; tying that fact to the life expectancy of men and women and you have the recipe for creating widows. The American Psychological Association says 40 to 50 percent of marriages in America end in divorce, again creating a new segment of the population called divorcees. Widows are more likely to be older than divorcees on average, but both segments are women without male partners. Both widows and divorcees come out of marriages, and marriage is a status that creates unique financial relationships. When those marriages cease to exist through either death or divorce, those financial relationships are altered. So, too, are relationships with financial advisors. 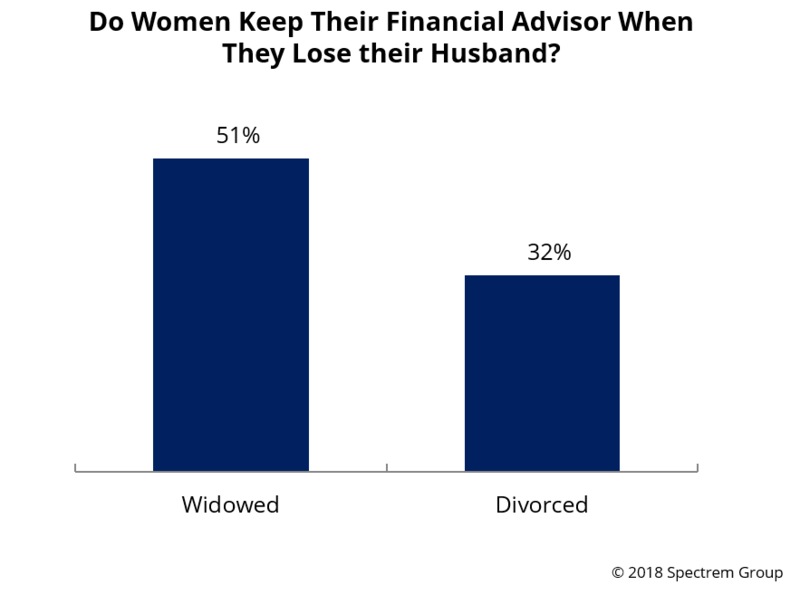 Spectrem’s new study on female investors who have lost husbands shows how these women reacted to the loss as it relates to their work with financial advisors. The research makes sense: widows are more likely to stay with the financial advisor they had when they are married, and divorcees are more likely to ditch their previous advisor as a way to distance themselves from the spouse they divorced. But why, exactly, are these decisions made? In Widows and Divorcees: Empowering Women in Transition, the investors explain their thinking. Seventy-two percent of widows had financial advisors before their husband died, and 51 percent of widows stayed with the same financial advisor after her husband’s death. Those widows who changed advisors after their husband’s death had a host of reasons for making the change, the most popular being that the advisor did not understand the widow’s financial goals (13 percent). Twelve percent said they did not trust the advisor, which begs the question whether that lack of trust existed when the advisor was working with the couple. It is interesting, however, that the change was not always immediate. One-third of widows waited five years or more to make the change, while just over 40 percent made the change within the first year after their husband’s death. Now, let’s look at divorcees. Almost half of divorcees did not have a financial advisor before getting divorced. Of the ones who did, 32 percent stayed with their original advisor, and 20 percent changed advisors. Of those divorcees who changed advisors, 60 percent made the change within the first year after the divorce. And for more than 40 percent of them, the reason they made the change is they did not want to use the same advisor their former spouse was using. Advisors need to be cognizant of the fact that a majority of their married female clients are going to be not married someday, one way or another. It is possible for advisors to maintain relationship with widows and divorcees, but they must work to create a sense of trust with both members of a married couple in order to do so.